1:7 scale statue of the elite samurai and 1st Lieutenant in the Imperial Royal Guard, Yui Takamura from the Muv-luv Alternative video game. This is a Kotobukiya Japanese import. 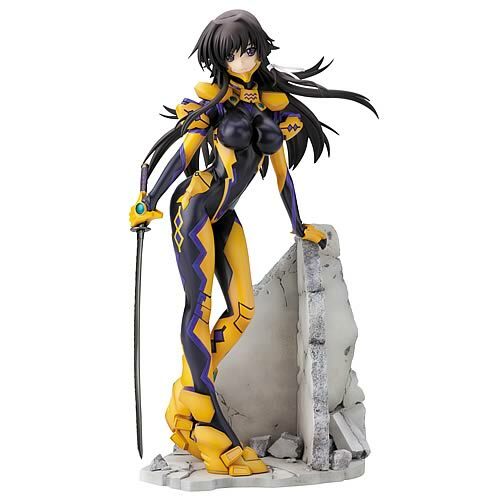 Yui Takamura stands triumphant on the field of battle in her armored black, purple, and yellow plugsuit having defeated her foes. She leans on one hand with her katana at the ready in the other. The pilot’s suit has striking sculpted details with armor sections, high-tech protrusions, intricate lines, and creases. Yui has a distant stare in her huge purple eyes and long tendrils of black hair swirl around her. Stands 10-inches tall (1:7 scale) on her unique rubble display base.